National is looking for brothers to share their memories of Brother Howard Alter on facebook. An example of Fraternity. A Theta Chi Legend. Most importantly, a brother. The first time I met Howard Alter, I was two weeks into my term as chapter president and a sophomore at the University of Alabama. He and Assistant Executive Director Dale Slivinske had been in the Deep South at a conference and decided to drop in on the chapters in Alabama. It was a chaotic Sunday night before student government elections on Monday, and the campus political machine was meeting in the basement at the moment Howard and Dale arrived. Last-minute campaign workers were in and out of the Theta Chi house, which was being used as a staging area. I had been told long before that when the day came that I met Howard Alter, I would know where I stood with him, that he was no-nonsense and to the point. Now that the day had arrived, I was a wreck. At a hastily called house meeting, Howard made very brief remarks and, wanting to hear what was on our minds, solicited questions. The first came without hesitation from an upperclassman intending to test the new young chapter officers: "Mr. Alter, what do you think of our machine politics?" The response was quick: "First, my name is Howard..." I don't recall the rest of the answer, but I realized at once that Howard could size up people and situations fast. I learned from that first encounter that he was someone on whom I could count for rock solid support. Howard Alter was a man upon whom many counted. He was not only an only child, but his cousin, Jim Booth, was the only child born to any of his parents' brothers and sisters. They would be the ones on whom aunts and uncles would rely as they aged. He was the son who went to New Guinea in World War II where he served as a Seabee, then returned to help his father run the family feed and grain business and assume the responsibility for his extended family. When then-Executive Director George Chapman, a founder of Howard's Omega Chapter, asked him to serve the Fraternity as a deputy regional counselor, George already knew that he could count on Howard just as the undergraduate chapter had when he was elected treasurer his junior year and president his senior year. As he began his service, the chapters in western Pennsylvania found a mentor and a champion. Soon he became regional counselor, and in 1960 "his" chapters nominated him to Theta Chi's Grand Chapter. Howard turned to his mentor, Executive Director Chapman, and explained that he had business and family responsibilities and that he just wasn't prepared for that investment of time. He recalled that Mr. Chapman wryly responded, "What makes you so certain you would get elected? You always lose once before you get elected." Whether his mentor was giving him serious advice or dodging a declination of the nomination, I suppose we will never know. Lose, however, Howard did not. He was elected to a four-year term and began that service as National Chaplain of Theta Chi. In 1962 in Seattle at the 106th Anniversary Convention, Howard Alter was elected National President, and service at the Fraternity's highest levels would distinguish the rest of his life. Two years later in Miami he was re-elected National President. During his tenure, Theta Chi experienced phenomenal growth, installing 13 new chapters. At the 1966 convention, Howard let it be known that after four years as National President, it was someone else's turn to lead the Grand Chapter, and he became National Treasurer. The following year, George Chapman announced his intention to retire after an unprecedented 20 years as Executive Director. Immediately a search committee was formed to find a successor to the irreplaceable Chapman. Scores of applications were received. One Sunday Spencer Shank, a member of the search committee, drove to the Alter family farm to brief Howard on the committee's decision. As they walked along the pasture fence after lunch, Brother Shank informed Howard that the committee had made a unanimous selection—Howard Alter. Howard protested, "I didn't apply; I am not a candidate," to which Brother Shank replied, "We know that, but you are our choice." It was no mistake that the committee had sent Spencer Shank, as he had served as Howard's National Vice President and was a persistent man who knew him well. Howard continued to protest, citing family responsibilities and the 325-mile distance to the National Headquarters in Trenton, New Jersey. The committee had considered that and had agreed in advance to permit Howard to move the headquarters to Pittsburgh. Protestations turned into negotiations—but not the kind you might imagine. Given the difficult times into which college fraternities were entering, Howard refused the salary that was being offered, insisting on some 40 percent less. Eventually, Brother Shank made perhaps his greatest contribution to Theta Chi Fraternity by wearing Howard Alter into sub-mission, and thus began the seminal journey of Howard's life and for Theta Chi. On January 1, 1968, Howard Alter became Executive Director of Theta Chi. He left his beloved Stockland Farm and drove six hours to Trenton, New Jersey, to begin the relocation of Theta Chi's headquarters. However, at the headquarters he found an office staff of exceptional tenure and experience. Mabel Oswaldt had served not only the entire tenure of George Chapman, but also that of Frederick W. Ladue and nearly the entire tenure of Alfred Aldridge. Gloria Metzger was in her 25th year. Howard quickly recognized the value of their experience and their loyalty. Almost instantly, he made the decision to keep the National Headquarters in Trenton and commute to Pittsburgh on weekends to attend to his family. That was a weekly 12-hour roundtrip commute that lasted 18 years. The late '60s and '70s were difficult times for the college fraternity movement, rife with an anti-establishment culture, individualism, and discord at the national levels of many fraternities and interfraternal organizations. Yet at the helm of Theta Chi was the steady hand of Howard Alter, who with George Kilavos as National President during most of those years, called us to our core values. He was a friend to every brother who sought his helping hand, and was once again the man to be counted upon. Never afraid to listen, but with a candor and courage of conviction that was integral to his being, Howard led Theta Chi through the storms. He did the same in the interfraternal world as well, serving as president of the Fraternity Executives Association and helping heal the rift in the National Interfraternity Conference, encouraging the return of those who had withdrawn. At his side was his assistant and the man he would groom to be his replacement, Dale Slivinske, another strong and courageous man. 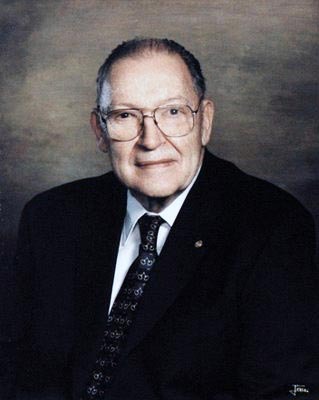 Howard Alter retired in 1984, becoming Executive Director Emeritus and was succeeded by Brother Slivinske. He was hardly through, however. He served on the National him the first to serve in all three of the Fraternity's highest offices. Throughout the remainder of his life, he was a fixture at nation-al conferences and conventions, imparting sage wisdom, and using his gift for relating to all generations of Theta Chi. He served on the board of the Foundation Chapter and was elected to the North American Interfraternity Conference's board of directors. In 1993, the NIC bestowed its Gold Medal, the highest award in the fraternity world, on Howard for a lifetime of service to Theta Chi and the fraternity movement. He was the recipient of every award that Theta Chi can bestow upon an alumnus brother, and Theta Chi's highest chapter award is named for him. Other awards filled his mantle including the Fraternity Executives Association's highest honor, and those of Phi Kappa Psi, Zeta Beta Tau, Lambda Chi Alpha, and many others. Brothers and guests check out all of Hoard Alter's awards and memento's at the summer Chapter Leadership Conference held on the weekend of July 17, 2009. Howard Alter's greatest contribution to Theta Chi, I believe, came in the form of a profound and courageous demonstration of the essence of fraternity—Theta Chi's Helping Hand. In 1987 shocking news came that long-time associate and now Executive Director, Dale Slivinske, had been stricken with AIDS—a diagnosis that at the time was a certain death sentence. Howard immediately began to assist with the daily operations of the headquarters again. Moreover, with grace and courage in the face of this feared disease, he joined Dale's brother Bruce in becoming a constant caregiver. Dale derived incredible strength and ultimately peace as he drew on the brotherly love of these two men—one his brother by birth and the other his brother by Theta Chi. As Theta Chi brothers and leaders of other national fraternities and sororities streamed to Brother Slivinske's bedside as he fought his losing battle, all were touched by Theta Chi's love, so movingly brought to life in the person of Howard Alter. As evidence, on the anniversary of Dale's death, over the next 20 years a group of interfraternity leaders and brothers closely associated with Dale have gathered from across the country at the black tie Slivinske Dinner in Pittsburgh to celebrate his life and honor Howard's courage, grace, and fraternal love. The last time I saw Howard was in his hospital bed at his beloved home at the farm a few days before his death. He opened his eyes, acknowledged my presence, and gave me the opportunity to tell him of his impact on my life, of the lessons he taught me, the example he set, and the memories that will remain with me until memory itself becomes a sealed book. While I spoke for myself, I am certain that we both knew that I must be speaking for scores of us who were privileged to have had him share so generously part of his life with us. A week later I would be back, honored to join past National President David DeVol and five other of "Howard's boys"—graying former field staffers—to bear him to the hilltop at the Plum Creek Cemetery, where were gathered eight Theta Chi National Presidents, scores of past National Officers, current and former staff, undergraduates, interfraternity friends, neighbors, and family. There, with military honors and the gratitude of Theta Chi for the richness of his life so selflessly shared, we said our farewell to Howard Russell Alter, Jr., Omega '41, knowing that his influence on Theta Chi lives on. Accepting the call to higher service with the Fratenity, Tim plans on working as a consultant before attending graduate school in the field of High Education Policy. Tim is an Eagle Scount and an aid volleyball and soccer fan, and would one day like to serve as the dean of students of director of student affairs at a major university. The Candle Ceremony was held for Howard R. Alter Jr., on July 17, 2009 on the campus of Villanova University. As a fraternity, we have lost one of our best to the Chapter Eternal. In honor and celebration of the life of Howard Alter, we are planning a memorial service and public ritual that will be held during the Friday evening session ofChapter Leadership Conference XIII. This very meaningful fraternity event will be held on Friday, July 17, 2009, at 8:00 pm in St. Thomas of Villanova Church located on the campus of Villanova University, Philadelphia, Pennsylvania. The service is open to all undergraduate and alumnus members of the Fraternity, as well as our guests. Howard’s life and service is a rich reminder of Theta Chi for life. Truly, Howard’s kindness and helping hand touched each of us in a remarkable way. During the evening, we will step back in time and journey through Howard’s tenure of fraternity leadership. We will remember again and drink deeply from his wisdom. We will mourn his passing into the Chapter eternal. And, we will celebrate just as Howard would have us do. A noteworthy group of gifted men have stepped forward in planning an event that will prove rich to our lives and our fraternity. Please join us for this special occasion. Since Howard’s passing, there have been many stories and thoughts exchanged about our beloved brother. In addition to planning the memorial service, we are hoping to receive from you many letters, emails, reflections, stories, and pictures that honor his profound influence on our fraternity and brotherhood. Because of their historical significance, I want to collect those items and organize them for our archives. Also, those reflections and stories will prove invaluable as we plan Howard’s memorial service at CLC. Please do not hesitate to share your thoughts with each of us. The logistical information for attending the memorial service can be found at Thetachi.org. There, you will find acampus map, driving instructions, Philadelphia airport information, hotel details, and information about campus parking (including a free parking permit across the street from the church). I think you will find the trip to be an easy one for many of you. I encourage you to plan early for transportation and hotel needs. Because the memorial service will be held in conjunction with the Chapter Leadership Conference, we also invite you to attend our closing banquet on Saturday, July 18 at 7:00 pm. This popular event will allow you to join the Grand Chapter, dozens of alumnus volunteers, hundreds of undergraduate brothers, and the International Headquarters staff for an evening of brotherhood rarely experienced in Theta Chi. If you would like to attend our closing banquet (and you are not a participant/faculty at the conference), please register at thetachi.org—follow the link for the Howard Alter Memorial where you will find details about our Saturday activities for alumni. The cost of attending the closing banquet is $40. We hope your travel plans will allow you to attend both weekend events. Again, we hope you are able to join us as we honor the life of our brother Howard Alter. There they sit at FEA meetings—the statesmen, the veterans, the men who led their organizations through some of the most tumultuous times in the history of Greek letter organizations…through the 1960s and 1970s—Viet Nam, fuel shortages, keggers, disco-- and the 1980s that brought increases in numbers but also many behavioral challenges. The hair—if it remains--is white or grey now. The posture is sometimes stooped. Some of them lean forward to hear, a hand cupped to an ear. But the eyes remain bright, the gestures quick, the smiles genuine. The Old Guard. The names are synonymous with leadership, with interfraternalism, with awards, with hundreds of banquets and thousands of nights on the road. Dud Daniel, Phi Kappa Psi. George Spasyk, Lambda Chi Alpha. Bill Schwartz, Sigma Alpha Mu. George Beck, Pi Lambda Phi. Henry Poor, Psi Upsilon. Robert Miller, Phi Delta Theta. Durward Owen, Pi Kappa Phi. And others, of course. I suspect that our FEA will never see the likes of the Old Guard again. As with nearly all other things, our association—perhaps more accurately our organizations within the FEA - have changed and grown and progressed, but change has a price. This year, there will be one more man missing from the Old Guard. His name is Howard Alter, Jr.
Let me tell you about Howard. He was born in 1918. People often asked me, “How old is Howard?” and I would smile and say, “How old do you think he is?” Some of us on the staff cheated—we looked up his birth year on his initiation form. He was over ninety years old when he left us early in the morning on May 9th. Howard joined Theta Chi at Pennsylvania State University after graduating from high school in 1936. He served as chapter treasurer and president. Once, when some of us were in State College for a Howard Alter Day, we found meeting minutes from the days when Howard was treasurer. The chapter secretary had written that Howard had been elected treasurer and in the next sentence noted that the social budget had been, “cruelly cut”. Even then his conservative ethos was at work. He graduated with a degree in Architectural Engineering in 1941. With World War II came service in the U.S. Navy—more specifically, with the Seabees—the navy’s version of engineers. Howard served in the South Pacific in New Guinea and reached the rank of Lieutenant Commander. After the war Howard returned to the Pittsburgh area and worked in the family business—the Hamilton-Alter Feed Store. More importantly to us, he became involved in the fraternity. In 1955, he was appointed a Regional Counselor. Fifty-four years later, his service to Theta Chi ended. In between, he served on our governing board and as National President from 1962 to 1966…as Executive Director from January 1st, 1968 to July 1st, 1984…as Executive Director Emeritus from that time until his death… and on our national housing board and as president and on both foundations that existed in the fraternity at that time. We will remember Howard for his service to Theta Chi. But we will also remember Howard for his strong commitment to the interfraternity movement. He was honored by eight men’s national fraternities for his interfraternal service, including the Ralph D. “Dud” Daniel Award from Phi Kappa Psi. That award—Howard was the first recipient of the award named in honor of his great friend Dud Daniel—meant so much to him. Howard also received the Gold Medal from the North American Interfraternity Conference in 1993 and he took great pride in his service on the NIC board. He treasured awards from Zeta Beta Tau, Lambda Chi Alpha, Sigma Nu, Alpha Kappa Lambda, Tau Kappa Epsilon, Kappa Delta Rhoand Alpha Chi Rho. Each was significant in its own way to Howard. As time passed I began to appreciate the interfraternal commitment that seemed to characterize everything that Howard did. No matter where we were or for what event, Howard seemed to know nearly everyone from other fraternities…and they knew him. Other executives attended our events and told us how lucky we were to have Howard. It occurred to me that their friendship was based upon something deeper than coincidence or timing—that the FEA was truly a group of like-minded individuals who supported each other through difficult times. They were a fraternity within the movement. I met Howard for the first time at my chapter at Michigan State University on a pleasant May afternoon in the early 1970s. I had recently been elected president of the IFC—a testimonial to the profound lack of capable candidates for the position—but like many undergraduates, I was full of myself and unflinchingly loyal to my chapter. Howard, Dale Slivinske and our national president were visiting as part of a fraternity barnstorming trip of sorts. I confidently told Howard that I thought our chapter was the best on campus. In retrospect, I might as well have donned a steak suit and walked into a den of hungry lions. “Well”, said Howard—a word that usually preceded a pronouncement accompanied by his stinging wit—“I don’t know if they teach reading at Michigan State…perhaps you’d like to see what Wilson Heller has to say about that”. He handed me a copy of Heller’s newsletter that contained a ranking of the fraternities at MSU. Our chapter was rated a distant fifth. Howard then asked if paying one’s bills on time would contribute to a good rating and observed that my chapter owed the Grand Chapter “A considerable sum”. Having brought me down several notches, he then said, “I’m glad to see you involved on the IFC, David”. And that is how things usually were with Howard. We remember the humor, the wit, and the lessons taught and also the kind word. And beneath that curmudgeonly, conservative skin of a man who enjoyed saying, “Sooner or later you will vote Republican” beat the heart of…dare I write it…a liberal thinker, at least at times. When our fraternity confronted the issue of the Caucasian Clause, I was told, Howard quietly worked behind the scenes to convince key leaders that the change had to be made, and then stepped forward to help lead the effort. He was a strong supporter of Hilary “Hip” Holloway, Kappa Alpha Psi and the first African-American to serve on the NIC board. When the women’s executives began their work to be included as full members in our FEA, Howard supported that change. As FEA President Bonnie Wunsch pointed out in a recent letter to Howard, he made her feel welcome at her first meeting, introduced her to a number of people and acted as a big brother might. And that was Howard. Always a gentleman, always looking out for others. I visited Howard in March of this year, only a few days after I sent out a message to a number of interfraternal friends about his situation and asking you to write to him if you could. I arrived on a Friday and went to his room in a senior care facility. And there was Howard, sitting in a wheelchair, watching the Golf channel, and holding forth on a variety of topics. He said that he had been to rehabilitation and he was having trouble squeezing things. I suggested that he pretend the things were Democrats. He laughed and we were off and running. We talked for over two hours—from the weather to the NCAA basketball tournament—I was able to trump him with the fact that his alma mater was playing the “Not Invited Tournament”—to the days in Trenton, New Jersey to the FEA and the upcoming NIC meeting. As always, Howard had a keen interest in what was going on in the NIC. His nephew, Bill Booth, brought a stack of mail from Howard’s home, and Howard fell silent as he began to open the letters and cards and read. Many were from you, his fraternal brothers and sisters. As he read, he coughed occasionally—a sign of emotion for Howard. He handed us each letter—that was his code for “I want you to know what someone wrote but I don’t want you to know that it means a great deal to me”. The words and phrases were special and meant much to Howard. I last saw Howard on April 28th of this year. The treatment for his cancer had failed and he decided to spend his final days at his beloved Stockland Farm—the old farmhouse where so many interfraternal friends had enjoyed drinks on the back porch. I was returning from one trip and preparing for another when Carlton Bennett, a Past National President, called me and said, “Dave, he doesn’t have much time left”. So I went to Pittsburgh. Howard was in bed and breathing with an oxygen mask. He was in and out, as they say—lucid moments followed by semi-consciousness. I sat on his right side and began showing him photographs I had taken at the NICmeeting and describing the people in the photographs—Dud Daniel, George Spasyk, Hank Bauer, Jon Williamson, Jim Estes—and Howard reacted. When someone in the room said, “Dave Westol is here”, Howard smiled around the mask and mumbled, “Of dubious character”…and that made the trip right there. That was pure Howard Alter, Jr.
Howard will be buried in the Plum Creek cemetery near his church on Saturday, May 16th. Many people will be there. But I suspect that the prevailing emotion will be humor and not sadness. The Howard stories—there are hundreds—will be told into the night. And that is the way that Howard would have wanted it. We in Theta Chi were blessed to have Howard as a brother. Equally importantly, we were blessed that Howard believed in FEA and the greater good. If a person is measured not by days or years or money earned or empires built but by the number of times that one helps others, Howard led a remarkable life. My thanks to all who have read this lengthy message and to all who wrote to Howard. You lifted his spirits and made him smile. He left us quietly on that Saturday morning…something he rarely did in life. To all of the family and friends of Howard Alter, I bring the most heartfelt condolences of Theta Chi Fraternity on his passing. While we join in mourning Brother Alter’s death, Theta Chi is also celebrating his truly remarkable life, and giving thanks for the unprecedented contributions that he made to our Fraternity during the more-than-70 years of his membership. Click image above to download Funeral ProgramTo sum up Howard Alter’s life, and its impact, on behalf of the whole Fraternity is simply impossible. There are literally thousands of brothers of Theta Chi, spanning at least 5 generations, who could stand here and speak eloquently of what Howard Alter meant in their lives. For myself, let me say simply that I believe that no person outside of my immediate family has had a bigger impact on my life. Many of you know the historical facts of his Fraternity career. Like most of our members, he went to college and joined our Fraternity as an undergraduate. Like too few of our members, Howard continued his service after his college graduation, serving first as a volunteer counselor to chapters in this region. As one of the elite among the core of volunteers, Brother Alter, in 1960, was elected by undergraduates representing our chapters to serve on the Grand Chapter, our national governing board. In the same manner, he was elected, twice, as Theta Chi’s National President, the Fraternity’s highest office. That volunteer service in and of itself would have constituted a noteworthy Fraternity career. But Howard was just beginning. As his 8-year term on the Grand Chapter neared its end, the Fraternity was conducting a national search for someone to replace its retiring Executive Director - a full-time position at the Fraternity’s headquarters, then located in Trenton, New Jersey. The search committee ultimately concluded that no candidate could fill this position as well as Brother Alter, and Howard agreed to take the position, even though it meant leaving his own business career, and leaving his beloved ancestral home here in Plum Borough. He served as Executive Director for 16 years, fostering the success of many dozens of chapters and thousands of Brothers. He retired, as he had always said he would, when he became eligible for Social Security, in 1984, and was named Executive Director Emeritus. At that time Theta Chi created in his honor the Alter Award, given each year to our most outstanding chapters. Theta Chi was very fortunate that, even after nearly 30 continuous years of service, Brother Alter still had much more to give, and to teach. He was immediately appointed to the Board of the Norwich Housing Corporation, which helps with the housing needs of our chapters, and soon became President of that Board, thus becoming the first man to lead all 3 operational branches of our Fraternity. More recently, he was instrumental in guiding the creation of a history of Theta Chi’s first 150 years, providing facts and perspective on the last 50 years, and he continued to attend Conventions and other national events regularly, even after travel became difficult and inconvenient for him, to teach and mentor. Sadly, just 3 years after Howard retired, Dale Slivinske, his hand-picked successor as Executive Director, who had served as Howard’s second-in-command for 15 years and had become his closest friend, fell ill with AIDS, and the prognosis was grim. Brother Alter stepped forward from his Emeritus position and made sure that the work got done. He also helped make sure that Theta Chi would not abandon Dale, but would treat him, and his illness, not just with compassion but with dignity and respect. In addition, Howard, along with Dale’s brother Bruce, personally nursed Dale through the extremely difficult last months of his life. During those months Brother Alter set an example, and a standard, of Brotherhood and friendship that the rest of Theta Chi, and the rest of the Interfraternal world, can only seek to emulate. At the end of the day, Howard Alter’s legacy is not about positions held, or policies implemented, or chapters started or saved, or awards won. It’s about brotherhood, and friendship – across chapters, across geographical regions, across generations, across political philosophies, and indeed across fraternities. Howard’s definition of brotherhood wasn’t confined to the halls of Theta Chi; many of his closest friends and greatest admirers were officers of other fraternities. A number of them visited Howard during his final illness. Because of the breadth and depth of his brotherly friendships, I submit to you that no man has ever had a greater impact on the men of Theta Chi. Howard did not relish the role of public speaker, and rarely spoke for very long. But he could be very moving, and he often closed with a poem. Many of you are familiar with it. But he turned, when he reached the other side, and built a bridge to span the tide. ‘Old man’, said a fellow pilgrim near, ‘you are wasting strength in building here. Your journey will end with the ending day; you never again must pass this way. There followeth after me today a youth whose feet must pass this way. Howard, no one could have built that bridge any better. Thank you for everything. A service of thanksgiving will be held at The Presbyterian Church of Plum Creek on Saturday, May 16, 2009 at 12:30pm, Reverend Doctor Jack Lolla (Beta Omicron ’77) officiating. Burial/Graveside service will take place at Plum Creek Cemetery. A reception will be held at Oakmont Country Club immediately following burial. Brother William Booth (Theta Chi ’09), 7151 Leechburg Road, New Kensington, PA 15068. Howard R. Alter Jr. '41It is with great sadness that Theta Chi Fraternity announces the death of Brother Howard R. Alter, Jr. May 9, 2009 at his home in Plum Borough, Pennsylvania. Brother Alter was a 1941 graduate of Pennsylvania State University, where he became a member of the Omega Chapter of Theta Chi Fraternity and served as chapter treasurer and president. Howard was appointed a Regional Counselor in 1955 and served in that capacity until his election to the Grand Chapter in 1960. He was twice elected as National President (1962-1966). Following his service on the Grand Chapter, he was appointed as Executive Director of Theta Chi Fraternity January 1, 1968. Brother Alter retired in June of 1984, and was appointed Executive Director Emeritus. The Howard R. Alter, Jr. Award for Chapter Excellence was created by past Field Representatives to commemorate Brother Alter’s retirement as Executive Director. The award is the highest honor bestowed on a chapter of Theta Chi Fraternity. The Alter Award was first presented in 1985. Following his retirement Brother Alter continued his service to the Fraternity by serving on the National Board of Trustees from 1984 to 1994. He also served on the boards of both foundations in our Fraternity -- the Foundation Chapter and Theta Chi Funds for Leadership and Education, Inc. Brother Alter has been honored with every award in Theta Chi Fraternity, including the Distinguished Service Award, the Fraternity’s highest honor, and the “Theta Chi for Life” Award. In 1993, the North-American Interfraternity Conference (NIC) bestowed upon Brother Alter the NIC Gold Medal, the highest honor in the fraternity world, for his interfraternal service. That service included serving on the NIC Board of Directors from 1985 to 1993, and serving as president for the Fraternity Executives Association (1978-1979). His lifelong and selfless work on behalf of Theta Chi Fraternity and the interfraternity world serves now, and will continue to serve, as an example for all to follow.